Developers: Ubisoft Quebec, Ubisoft Montreal, Ubisoft Bucharest, Ubisoft Singapore, Ubisoft Montpellier, Ubisoft Kiev, Ubisoft Shanghai. I’m beginning to think it’s time Assassin’s Creed moved on from its title. After eleven years and as many games, the series has drifted increasingly far from its core concept of sneakily stabbing people and then running away. Frankly, it was never that good at portraying assassination in the first place, certainly not compared to the likes of Hitman and Dishonored, and with the exception of Assassin’s Creed II, the best games in the series have only been tangentially related to the premise. With Odyssey, Ubisoft further shows that this series is at its strongest when it has nothing to do with Assassin’s Creed. This massive RPG (and Odyssey is, truly, an RPG) takes place 400 years before the organisation of Assassins is even founded, while design-wise the game bears more in common with The Witcher 3 than it does its own franchise. This comparison is merited by more than mere design choices. 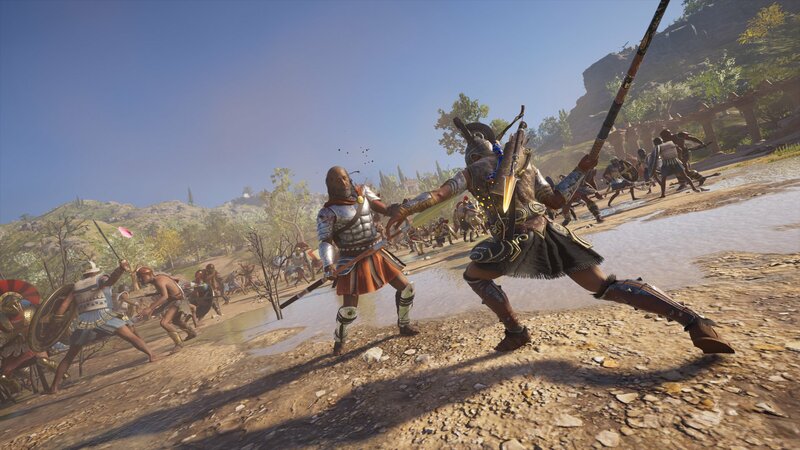 Assassin’s Creed Odyssey is not only the biggest game in the series but also probably the best. 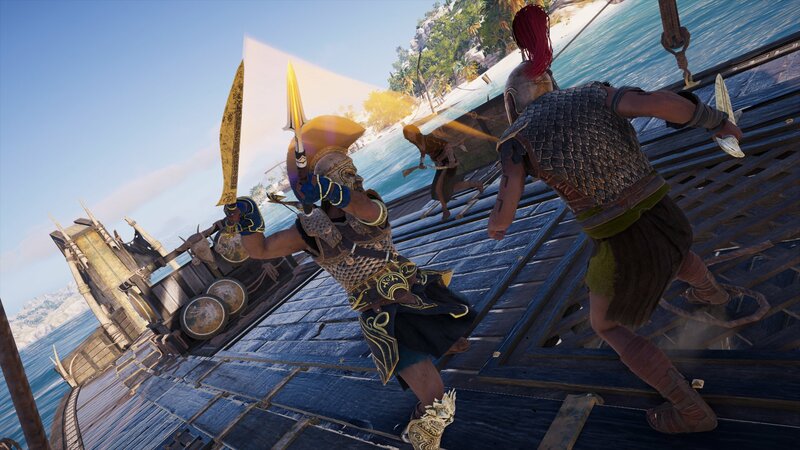 Odyssey takes the fundamental system changes made in Assassin’s Creed Origins, and combines them with a cornucopia of new features that make the game more dynamic, more personable, and much, much deeper. What results is a thrilling, gigantic, and stunningly beautiful adventure that truly lives up to its title. Odyssey starts as it means to go on, by offering you a choice. 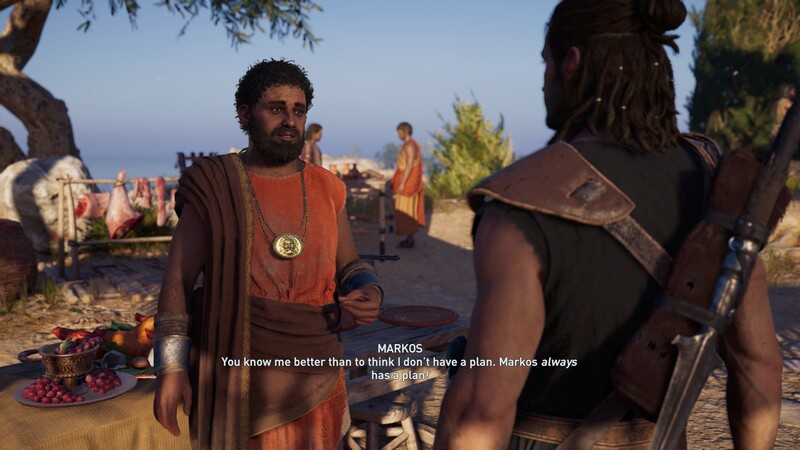 The story focusses on one of two characters, Alexios or Kassandra of Sparta, both of whom are professional mercenaries for hire. Like Mass Effect, the story is for the most part identical regardless of which character you choose. 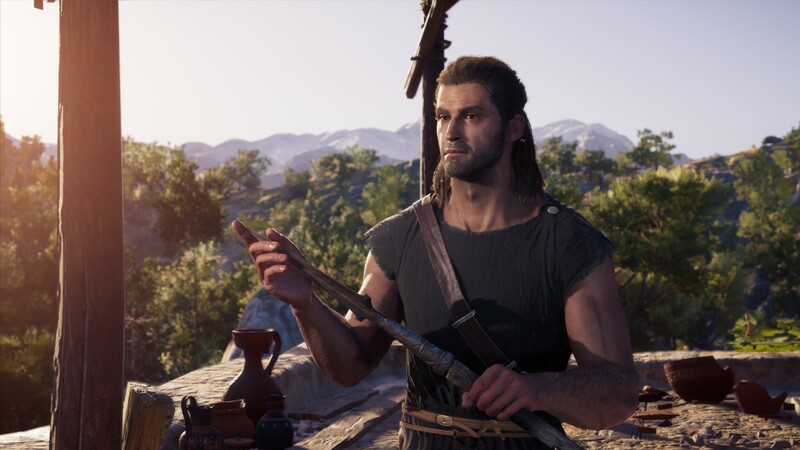 I opted for Alexios, mainly because most of the other coverage I’ve seen focuses on Kassandra. 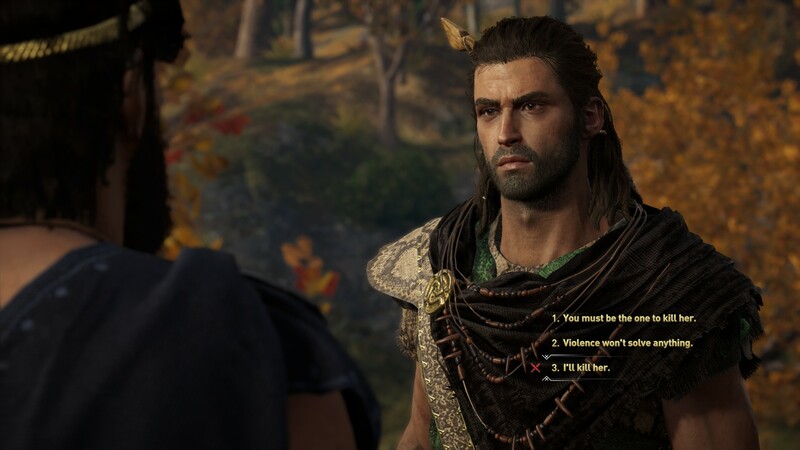 As it turns out, Alexios is a perfectly likeable chap, occupying a midpoint between Ezio Auditore’s youthful optimism and Geralt of Rivia’s world-weariness. He’s fairly cheerful, if rather blunt. Indeed, his straight-talking manner cuts through Athenian politics just as his spear-tip cuts through bandits. Whichever road you travel, it always starts from the same point, the Greek Island of Kephallonia. Your character, the grandchild of King “This is Sparta” Leonidas, spends his days doing odd-jobs for a local merchant who is basically the Ancient Greek equivalent of Delboy Trotter. That all changes once they’re offered a contract to kill a Spartan general waging war against Athens. This proves the spark that begins a truly epic journey that involves searching for your family and a battle with a mysterious cult aiming to control the Greek world. The storytelling is where Odyssey’s similarities to The Witcher 3 are strongest. Everything from the camera angles to the presentation of dialogue choices are almost identical to CD Projekt’s fantasy masterpiece. Odyssey’s tale ultimately proves an inferior one, lacking The Witcher 3’s emotional resonance and its coherence both in character and tone. But The Witcher 3’s heights are lofty indeed, and Odyssey’s tale is still very enjoyable, with a stirring sense of adventure that offers a rich and varied array of quests. Many of these quests involve choices that resonate through the rest of the game. In one early example, you’re sent to a local town devastated by a deadly and highly contagious plague. There you find an infected family about to be sacrificed to appease the wrath of the gods. You can either intervene or allow the execution to proceed, either of which will have consequences for your tale farther down the line. Again, they’re not as coherent as CD Projekt’s work, but they do enough to keep you involved in what’s going on. Even in those moments where the story or the questing falters, the world of Odyssey never ceases to impress. The scale of the thing is truly immense, including a massive chunk of the Greek mainland and most of the major islands in the Aegean Sea, including Crete, Lesbos, and Euboea. Within its gigantic sprawl are dozens of towns and villages, and multiple huge cities, such as Argos, Sparta, and of course Athens. The latter in particular is a truly dazzling place, a vibrant and bustling city lined with marble collonnades and brightly coloured statues, overseen by a towering bronze effigy of Athena stood atop the Acropolis. Here you’ll rub shoulders with Socrates, Pericles, Sophocles, and many other notable figures from Greek history. 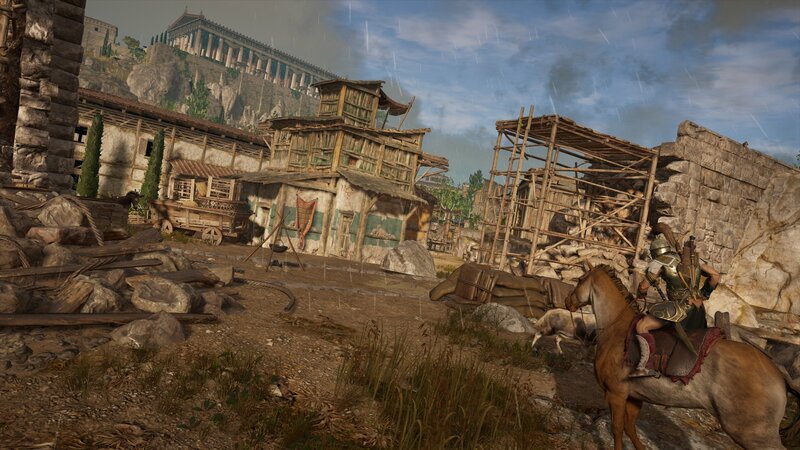 The detail is absolutely astonishing - from sculptor’s yards to the trade hub of the agora, to the dilapidate flooded district where the poorest citizens live. There’s even a Spartan siege camp just outside the city’s walls, and an area where the walls have been breached and the hole hastily plugged with wooden palisades. 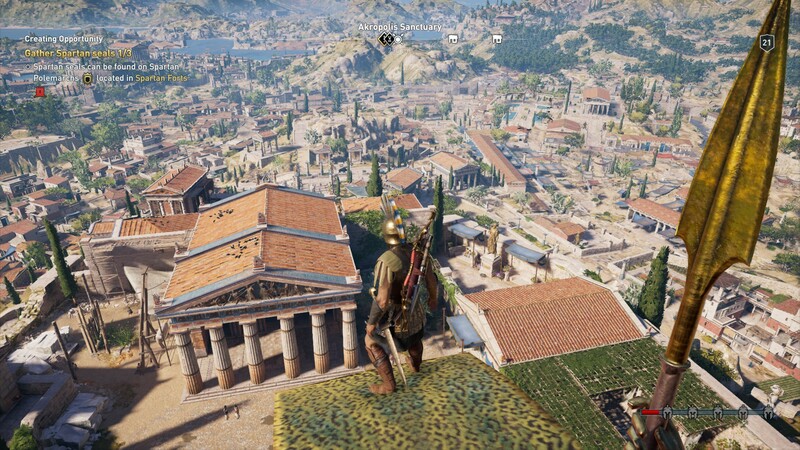 Odyssey’s Athens could easily make for the setting of an entire game in and of itself. Yet at the scale Odyssey plays at, this enormous, beautiful metropolis barely registers on the map. 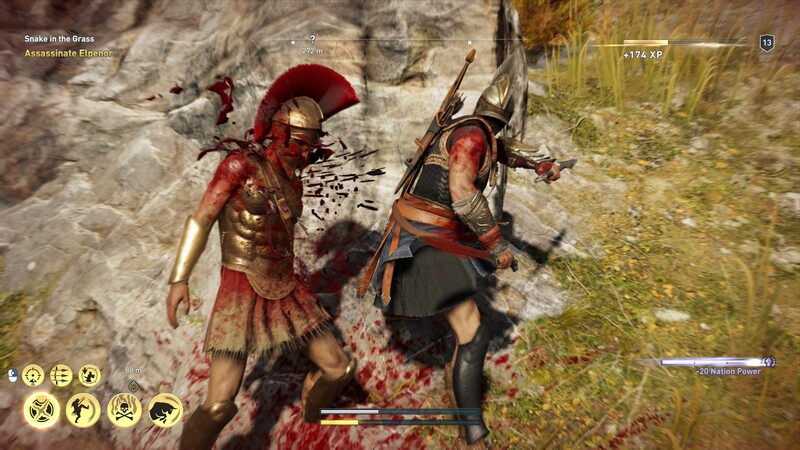 In terms of play, Odyssey’s core is largely similar to Origins. Most of your time is spent either sneaking through restricted areas, battling enemies in combat, or exploring unique locations such as ancient tombs and underground caverns. Exploration in particular is emphasised, not surprising given the title. On its default setting, Odyssey doesn’t reveal quest locations to you automatically. Instead, you have to find them using hints given to you by quest givers. At first I was sceptical about this, as I didn’t want to be wasting time getting lost in a game this huge. As it turns out, however, exploration mode is fun and well balanced. So long as you remember to ask a quest giver where to go, they usually provide enough information so that you can determine the approximate area on the map. Once you get close enough, you can use your trusty Eagle friend Ikaros to pinpoint the precise location. It’s similar to what Kingdom: Come Deliverance did earlier this year, only much more streamlined. It helps that Odyssey’s world is a huge amount of fun to explore. 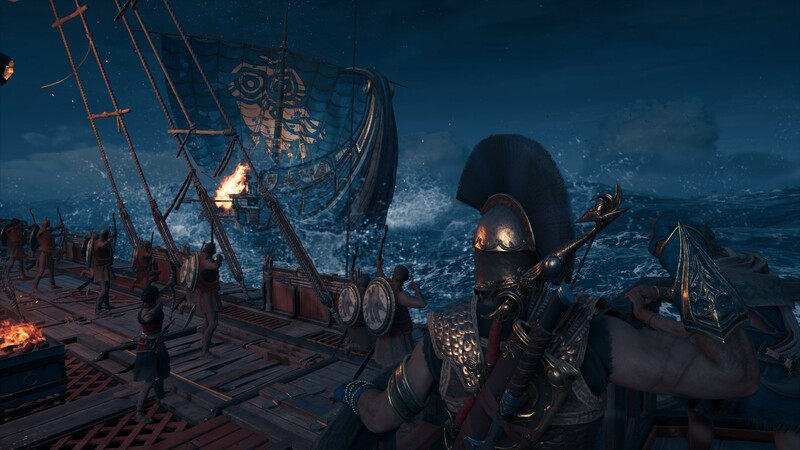 From looting shipwrecks at the bottom of the ocean, to investigating the ruins of even more ancient civilisations, every new question mark on Odyssey’s map tantalises with promise. The rewards are predictable – a slightly better weapon or armour piece – but the way each area is structured makes the act of discovery a reward in and of itself. 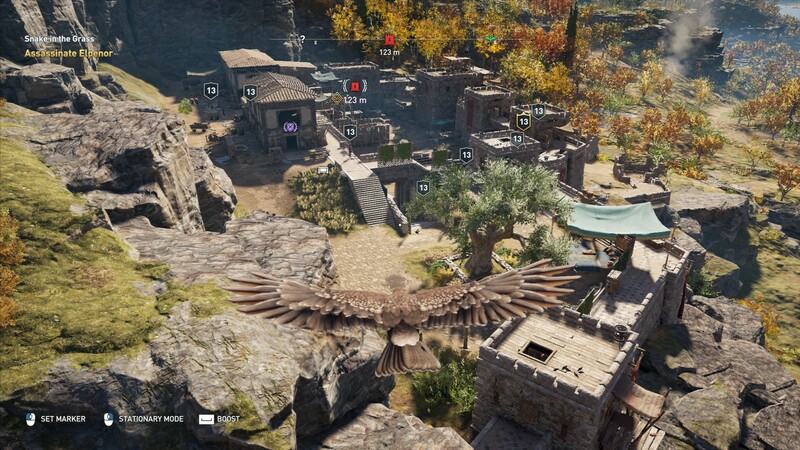 Alongside the changes from Origins, Odyssey introduces two new mechanics, and brings back another one from an earlier Assassin’s Creed. The latter is the naval combat from Black Flag. 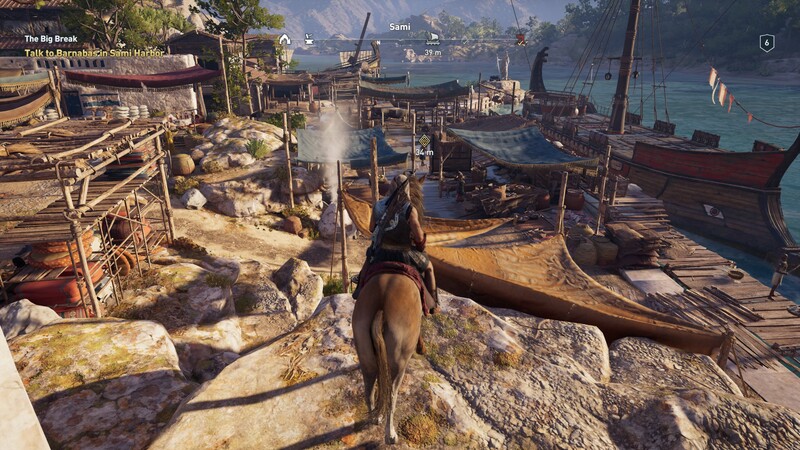 Early in the game, you’re given access to the Trireme Arestria, which serves as your main mode of transport between the Aegean’s many islands, and lets you hunt pirates and other sailing vessels. The system is largely similar to that seen in Black Flag, although your cannons have been replaced with archers, and you can now ram into ships to cause damage. If done right, this will split the ship clean in two, which is very satisfying. 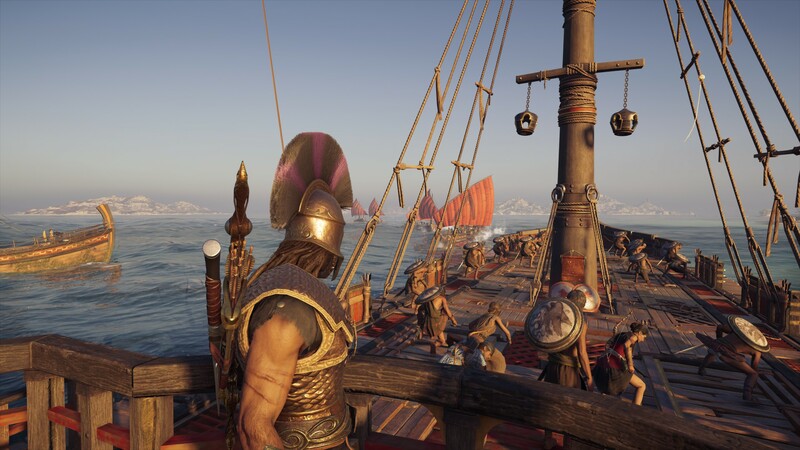 It’s great to see Assassin’s Creed back on the water again, and sailing between those Greek islands in search of adventure is a perfect encapsulation of Odyssey’s spirit. The new systems, meanwhile, focus on making Odyssey’s world more dynamic. First up are mercenaries, semi-procedural enemies who roam freely around the game world, much in the same vein as Shadow of Mordor’s Uruk captains. If you commit a crime, such as killing a guard or stealing from a house, a bounty will be placed on your head, and mercenaries will hunt you down to claim it. They’re not as unique or colourful as Shadow’s delightfully devious Uruks, but they do spice up the game’s combat. The only downside is the system is a little too aggressive, often throwing multiple mercs at you in quick succession and making you more keen to pay off your bounty to avoid getting into an overly protracted fight. More involved than the Mercenary system is the War system, which simulates the Peloponnesian war across the game world. Each Greek state is controlled either by Sparta or Athens, but that control is not set in stone. States can change hands autonomously of the player, but you can also get your hands dirty to change the situation yourself. Each state has a stability level that can be reduced by killing soldiers, burning war supplies, or assassinating that state’s leader. Drop it low enough, and you’ll trigger a Conquest Battle, a huge and bloody scrap that you can take part in either as an attacker or a defender. It is, frankly, a ridiculously ambitious concept, and one that you can approach however you like. You can pick a side and try to steer the course of history in your chosen direction. You can game the system by picking up quests that work to your advantage and reap substantial rewards. Or you can ignore it entirely, and let the war play out as it will while you concentrate on your adventure. I kind of like the fact that it’s something you can dip in and out of, but part of me wishes it was a little more deeply intertwined into the other game’s systems. These are the primary new additions, but there’s at least five other smaller ones, like the Legendary Beasts that prowl the countryside, and the mythical creatures that exist somewhere on the fringes of the game world. There’s also a massive, open-ended side-quest dedicated in which you eliminate the ringleaders behind the Cult of Kosmos. There are around 40 cultists roaming the world, hidden both within and without society. To find them, you have to first reveal their identities by tracking down clues, which can be found via other quests, other cult members, or in specific locations. It says a lot about Odyssey that I almost forgot to mention this, and yet cultist hunting is one of the things I’ve most enjoyed about the game. It’s scarcely believable how rich and varied this game is. One minute you're hunting the ocean for pirates, the next you’re orchestrating the downfall of the Spartans in Argos, and no sooner have you finished that, you’re off on the trails of some mythical beast. As you can probably tell, I like Odyssey a lot. But I do have one big problem with it, and that’s the level-gating. As with Origins, every enemy you encounter has a set level that defines how likely you are to beat them, and each area of the map is designed to be played at a certain level. I don’t mind the level gating in and of itself – I was so keen to explore the world that I was always ready for the next challenge. I also don’t mind the fact that low-level areas scale up with you, meaning that if you miss a low-level area while following the story, to it still provides the right amount of challenge and experience when you do get around to it. What bothers me is both combat and stealth are too heavily geared toward stats and abilities rather than skill. The stats focus often means that you can’t assassinate key targets outright because they have too much health, meaning you’ll stab them in the neck and then alert half the camp to your presence, forcing you into combat. Meanwhile, on normal difficulty enemies have way too much health in general. I ended up turning it down to easy, not because I was struggling, but because I was getting bored whittling down enemy health bars with attacks that seemed to do hardly any damage (this is with enemies on par to my level). There’s also a notable hump in the difficulty which you need to get over, which crests around level 10 and then tapers off somewhere between 15 and 20. Incidentally, the combat is pretty good, especially once you’ve unlocked a few of the cooler abilities like Shield Disarm and Spartan Kick, both of which are really satisfying ways of dealing with an opponents. Nonetheless, I feel the game would benefit from approaching stealth and combat more like Hitman or Dishonored do, with damage based on how you attack an opponent and what kind of protection they’re wearing, rather than the size of the number hovering above their head. Basically, I feel like there’s a better way of making the stealth and combat an interesting challenge than dictating the player’s experience through enemy level. If it wasn’t for this, Odyssey would probably be riding high as my game of the year. Even so, it’s still a majestic and thoroughly entertaining adventure, one of those rare games that actually justifies its ludicrous size and scope. I thought I was done with Assassin’s Creed games, and in a way I still am. Odyssey, though, is barely an Assassin’s Creed game at all, and it’s all the better for it. Walk like an Egyptian in Ubisoft's triumphant Assassin's Creed return. While it looks the part, Assassin's Creed takes itself far, far too seriously.